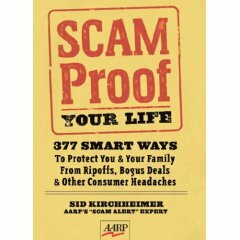 Get inside information on how to protect your money, your rights and your health with this complete and practical collection of consumer tips by Sid Kirchheimer, AARP scam specialist. More than 100 experts reveal specific tips, techniques, and tactics that anyone can use to avoid being victimized financially, physically, or emotionally. Car salesmen disclose secret strategies to save you thousands of dollars on your next vehicle purchase. Repairmen divulge the tricks of their trades and disclose the advice you'll need to get superior service at an honest price. Con men and crooks offer defensive directives to deprive thieves of your money, your possessions, and your identity. Kirchheimer gets experts to cough up everyday counsel. Doctors share simple steps you can take today to guard against medical errors and lower your health-care costs. Attorneys tell how to protect yourself in a courtroom and in daily life. Industry insiders and consumer advocates detail when, where, and how to get the most for your time and money. They expose stealthy solutions for saving when you buy a home or apply for a mortgage, telephone service or a credit card. They tell you how to save big on travel arrangements and how to secure a college scholarship for less-than-Dean's List students! Scam-Proof Your Life was written by award-winning consumer crusader Sid Kirchheimer, who writes the popular "Scam Alert" column in The AARP Bulletin the most widely circulated newsletter. Kirchheimer is the author of The Doctors Book of Home Remedies II (2 million copies sold), Never Pay Retail and other books devoted to empowering ordinary people to protect their money, time, health and security.